1941: The Smith-Putnam Wind Turbine feeds AC power to the electric grid, the first wind machine ever to do so. The unprecedented project was built up from nothing, practically conjured, by Palmer Putnam, an MIT-trained geologist with no formal education or experience in wind power. He was a fascinating character, a clean-energy entrepreneur 70 years ahead of his time. Vannevar Bush, President Franklin D. Roosevelt’s science adviser, showered praise on this engineer-of-all-trades, calling Putnam a “go-getter” in his autobiography and noting that he “had some of the characteristics of the best type of promoter in industry. He was well-liked by men with lots of drive, and often disliked by those with less.” His friends called him Put, after the Greatest Generation–traditions of the day. Before this project, windmills had just pumped water for farmers in the boonies, or charged the batteries of rural radios so they could pick up the AM stations that brought news across the lonely, whistling prairies. The people who sold windmills marketed them to ranchers and farmers; their advertisements appeared in magazines like American Thresherman , Farm Power , Agricultural Technology and Successful Farming . The American windmill, as it was called, was simple and Western and rugged. Its shape hardly changed after key 1880s experiments by Thomas Perry resulted in the founding of the Aermotor company, which dominated the industry thereafter. But that’s not the kind of turbine that Putnam had in mind. After looking into the designs of the past, he immediately decided that the economics of scale dictated that he build a wind turbine with 75-foot blades, the largest in the world. It would generate more than a megawatt of power and feed it on to the grid, working in tandem with a hydroelectric plant to even out the intermittency of the wind and the seasonality of water generation. No one had ever pulled off that balancing act before, and most people working in the wind industry were probably too sane to try. It’s important to understand how ridiculously grand the project really was. Its scale — 10 times as powerful as the very largest turbine and a thousand times more powerful than most of them — was almost unimaginable. To plan an equally ambitious project today would mean setting out to build a machine that pumps out 65 megawatts. This was a small group of inventors’ attempt to make a leap into a different future with breakthrough technology. The construction of such a novel machine was lousy with difficulties, some internal and many external. The exigencies of a country preparing for war caused delays and trouble. 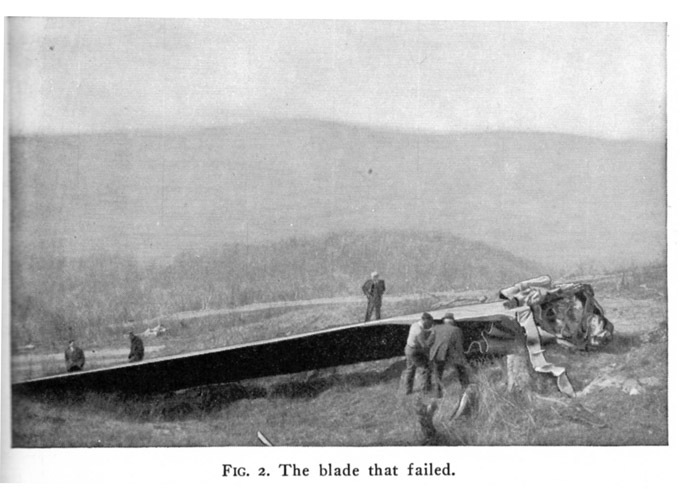 The inventors’ desire to finish and monetize the turbine before the war reached the United States may have accelerated the pace of R&D beyond what prudence would have dictated. The strange thing is: Putnam succeeded. The turbine ran through hundreds of hours of testing up to 1943, often pumping power onto the Central Vermont Public Service Corporation’s electrical grid. The project’s engineers were sure that, technically, the machine worked. The Smith-Putnam wind turbine stood as a testament to the power of human — and American — ingenuity. A decade before, Soviet engineers had built the world’s largest wind turbine, a 100-kilowatt machine. Now the Yanks had constructed their own, 10 times more powerful. Time concluded its article on the project with a hopeful half-prediction, “New England ranges may someday rival Holland as a land of windmills.” This was, after all, merely the prototype for whole lines of turbines that would be more resistant to German bombs than a centralized coal plant. Unluckily, a bearing broke in 1943, and the war prevented its replacement until 1945. With the war waning, the wind machine got back up and running in the spring of that year. And that’s when disaster struck.